I just went to another Asian market today – eagle eye reader – Tzivia R. told me about it. Ali B. went with me – which was so much fun – first she knew how to get there (a big plus) and second – she knew her stuff about strange fruit (don’t get the durian fruit – unless you are willing to hold your nose, apparently it tastes ok but the smell is something you very much wouldn’t want to eat — apparently these fruits are banned in public places in Singapore. It’s this big spiky fruit – I didn’t get a picture, but pisces.eu had a picture I borrowed below). 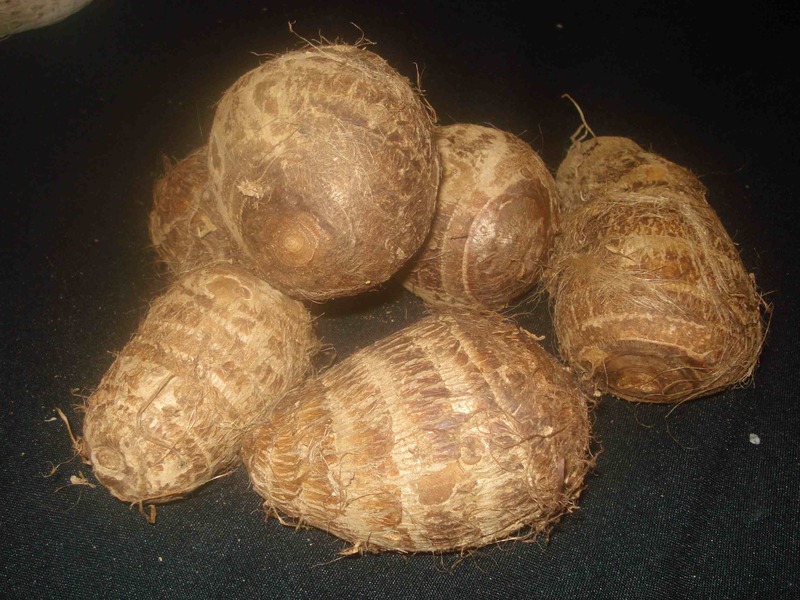 They had all the usual fruits – but we also got malanga – this is a tuber that is one of the vegetables used in the Taro chips bag. You can tell from the dots. See picture. I got actual taros – these are toxic raw and must be cooked to be eaten (who ate these first, I always wonder. When something is horrible raw (or worse yet, toxic) who is willing to say, “you know what, let’s cook it and try it again?”). And they had 2 types of persimmons (see below). The big kind and the round little kind. One of them tastes great when black. Not sure which one and if it’ll last that long. I’ll try to find a recipe with persimmons in it, but it’s a little pointless, since I know I’m just going to eat them before I get a chance to cook them. And then, although we spent the majority of our time in the fresh fruit section – they had a ton of dried beans, specifically the kind I need for a number of Indian dishes. So, on the whole, a great adventure, and I’m looking forward to going back and exploring more of the store. as well as green plantains – it looks like a banana but must be cooked before eating (not to be confused with the plantain that turns yellow when ripe, which they also had). And they had pomegranates – however, theirs was 1 for $2, and 7 mile has their pomegranates for 3 for a $1. Wow, I wouldn’t want to eat something that smelled like throw up. Who would buy the Durian fruit?